AZ Helping Hands opens new facility in near the 51 and Thunderbird. Arizona Helping Hands now has a brand new home in Phoenix. The organization helps support families and 16,000 children currently in foster care throughout Arizona. Their new 18,000-square-foot building called the "Care Barn" will be home to clothes, mattresses, diapers and other essential supplies for foster families. The space will also be home to a community room for families and volunteers as well as other foster non-profits that work in Arizona. 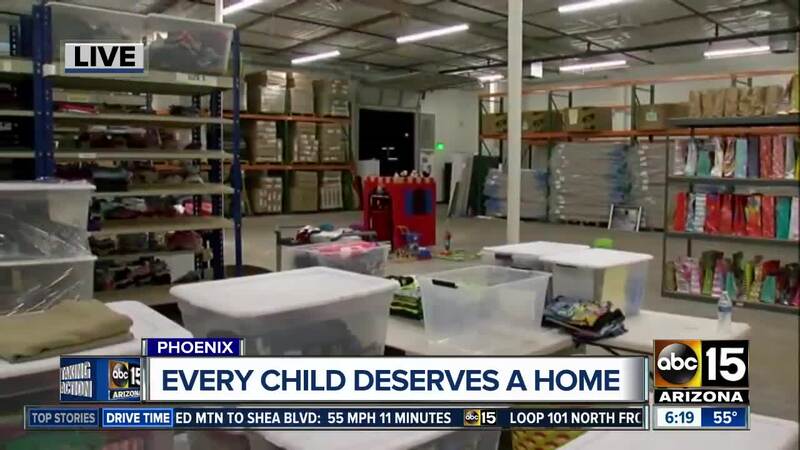 "These simple basic needs that we provide to kids give them support, give them hope and also add joy in their lives," says Dan Shufelt, President & CEO of Arizona Helping Hands. Previously, the organization was in an 8,000-square-foot space which they had outgrown. Arizona Helping Hands was founded 20 years ago by Kathy Donaldson and her late husband inside their Arizona garage. Their new building is located at 3110 E. Thunderbird Rd. in Phoenix. To help donate, volunteer or learn more about Arizona Helping Hands, click here .